Dublin progressed to the knockout rounds of the Leinster U16 Ladies Football Championship with a comprehensive victory at the expense of Kildare at TU Blanchardstown on Sunday afternoon. Following a defeat to Meath in their most recent Group A encounter, the Sky Blues were aiming to get their campaign back on track. The Royal County’s win against Longford on Saturday meant they needed at least a draw to be certain of qualification, with Kildare still possessing a slender hope of making it past the round-robin phase. However with skipper Katie O’Sullivan, Aisling O’Neill and Emma Howe all in devastating form, they always held the upper hand over the Lilywhites. Despite being on home soil, Declan Darcy’s charges had reason to be wary of Kildare’s challenge – who had encouraging spells in their back-to-back reversals to Meath and Longford. The visitors had the aid of a strong breeze during the first half, but suffered an unfortunate set-back in the opening minute of the contest. After rolling her ankle close to the Kildare posts, full-back Aaliyah O’Toole was withdrawn from the action. This led to the redeployment of corner-forward Ella Hayes at the heart of their defence – a position the Maynooth star is readily accustomed to. Nevertheless, it was Dublin who ultimately broke the deadlock through quick-fire O’Neill and Leah Keogh points. The maiden goal of the tie inevitably arrived in the 12th-minute, when O’Neill released O’Sullivan for a superb finish beyond the reach of Kildare’s Fiadh Whiteley. Dublin continued to ramp up the pressure on the opposition rearguard, with Howe, O’Neill and Eva Ahern contributing scores in quick succession. O’Sullivan and Keogh added points inside the second-quarter, before Castleknock’s O’Neill grabbed a second major at the end of another intricate attacking move. Kildare finally posted a response on 25 minutes, Hayley Wiltshire kicking an excellent point on the run. O’Neill’s 1-1 salvo re-established Dublin’s authority, though, and Keogh subsequently ensured they brought an insurmountable 3-9 to 0-1 cushion into the interval. Kildare sought fresh impetus to their play by introducing a number of substitutes either side of the break, while the Metropolitans fully unloaded their bench as the second period wore on. O’Sullivan boosted her haul on the restart with another superb point, only for Kildare to briefly halt their momentum. Zoe Brierty picked out Rebecca Travers in acres of space and the Rathcoffey midfielder fired a powerful right-footed drive past Dublin custodian Molly Cassidy. Yet, this only served as a temporary respite for Terry Boyle’s side. Whereas Whiteley was able to get significant distance on her kick-outs when the wind was at her back, it proved more difficult on the resumption. Supplementing an Ella Darcy point, Howe took advantage of some loose defensive play to claim Dublin’s third goal on 36 minutes. They had to wait a further 10 minutes for their next score, with a number of new faces taking their time to settle into new surroundings. In this juncture, Wiltshire added a second point for Kildare and Ballykelly’s Eimear Hanlon was marginally off-target at an awkward angle. Wiltshire’s free was eventually cancelled out at the opposite end by Ciara O’Connor – the first Dublin replacement to get her name on the scoresheet. St Sylvester’s ace O’Sullivan joined O’Neill in bagging a brace of majors and O’Connor’s second point gave them a 24-point buffer (5-14 to 1-2) inside the closing 10 minutes of the proceedings. The hard-working Wiltshire registered her third point for Kildare, but their opponents were determined to finish on a high. Like her Clontarf club-mate O’Connor, Ava Corcoran was eager to stake her claim for a starting position. In between well-worked points, she secured Dublin’s sixth goal to round off an accomplished team display. 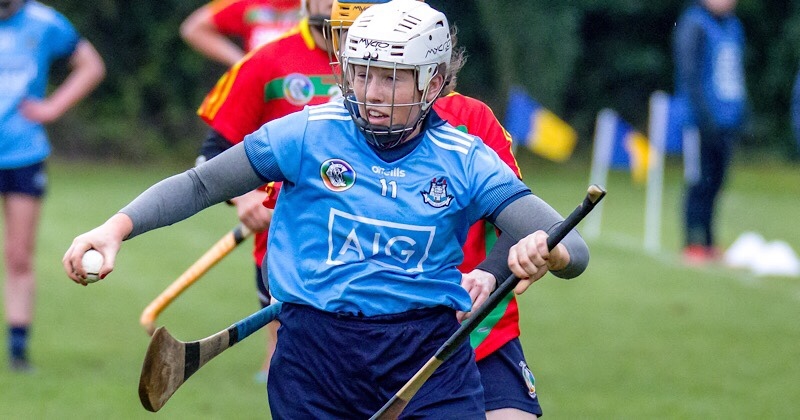 Dublin Scorers: Aisling O’Neill 2-03, Katie O’Sullivan 2-02, Emma Howe, Ava Corcoran 1-02 each, Leah Keogh 0-03 (1f), Ciara O’Connor 0-02 (1f), Eva Ahern, Ella Darcy 0-01. Kildare Scorers: Rebecca Travers 1-00, Hayley Wiltshire 0-03 (1f). Dublin: Molly Cassidy (Na Fianna); Erin Christie, Katie Quinlivan (both Ballyboden St Enda’s), Teegan Comber (St Finian’s, Swords); Roisin Quigley (Clontarf), Lucy Crowe (Clanna Gael Fontenoy), Lucy Quinn (Castleknock); Ali Griffin (Clanna Gael Fontenoy), Rebecca Duffy (Foxrock/Cabinteely); Leah Keogh, Katie O’Sullivan (both St Sylvester’s), Eva Ahern (Na Fianna); Aisling O’Neill (Castleknock), Emma Howe (St Finian’s, Swords), Ella Darcy (Clanna Gael Fontenoy). Subs: Sophia Nyhan (Na Fianna) for Comber (29), Hannah Rooney (Clanna Gael Fontenoy) for Quinlivan, Aoife Coppinger (St Peregrine’s) for Quigley (both 37), Sarah Willis (Ballyboughal) for Griffin, Ciara O’Connor (Clontarf) for Keogh (both 40), Amelia Ryan (St Brigid’s) for Ahern, Sinead Flannery (Foxrock/Cabinteely) for Howe (both 45), Emma Kane (Kilmacud Crokes) for Duffy, Emer Crowley (Kilmacud Crokes) for O’Sullivan, Ava Corcoran (Clontarf) for O’Neill (all 48), Emily Foster (Foxrock/Cabinteely) for Cassidy, Emma O’Brien (Lucan Sarsfields) for Christie, Aoibhin McCarthy (Raheny) for Crowe, Eimear Mangan (Clontarf) for Quinn, Aimee McKeon (St Oliver Plunkett’s/Eoghan Ruadh) for Darcy (all 52). 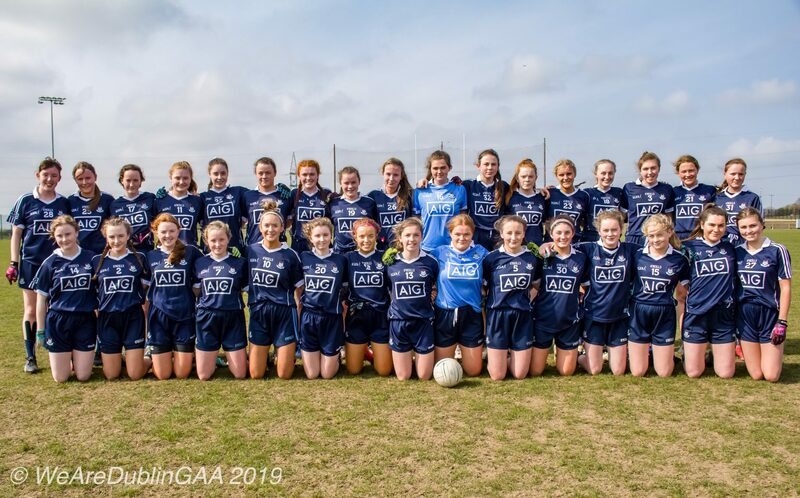 Kildare: Fiadh Whiteley; Muireann Ures (both Ellistown), Aaliyah O’Toole (Leixlip), Fáinche Grimes (Confey); Doireann Killeen (Cappagh), Hannah Davis (Maynooth), Holly Tyrell; Rebecca Travers (both Rathcoffey), Emma McAleenan (Kill); Hayley Wiltshire (Na Fianna), Eimear Hanlon (Ballykelly), Elena Prendergast (Naas); Dara Hodson (Sallins), Niamh Mortell (Celbridge), Ella Hayes (Maynooth). Subs: Jill O’Toole (Kilcullen) for O’Toole (3), Zoe Brierty (Carbury) for Prendergast, Aisling Archbald (Naas) for McAleenan (both 30), Aoife Kilkenny (Carbury) for Hodson, Áine Dooley (Maynooth) for Killeen (both half-time), Beverly Moran (Na Fianna) for Travers (49), Prendergast for Wiltshire (54), Killeen for Hayes (58).